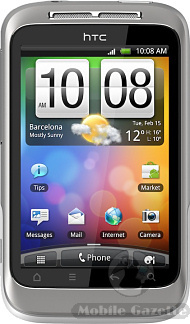 The follow up to last year's HTC Wildfire, the new HTC Wildfire S has a better screen, more RAM and a slightly faster processor in a lightweight and relatively compact package that forms the entry level for HTC's Android range. The Wildfire was (and still is) a very popular handset, giving a pretty decent smartphone experience for about €250 SIM-free. Perhaps the biggest criticism that you could make is that the old 240 x 320 pixel touchscreen wasn't really good enough for things like web browsing, so the improved 320 x 480 pixel panel in the Wildfire S looks like a better bet. On the back of the Wildfire S is a five megapixel camera with autofocus and flash, it can also record video although we don't expect it to support HD. As with all Android phones, the Wildfire S has GPS and WiFi (including 102.11n support) plus HSPA (3.5G) data and Bluetooth. This is an Android smartphone, but HTC haven't said what version of the operating system it is running. HTC have enhanced it with their own HTC Sense interface, including their Friend Stream social networking service. Inside is a 600 MHz processor coupled with 512MB of RAM. Not a lot compared to high end smartphones, but good enough for most applications.. remember that some of these devices cost three times as much as the Wildfire S.
It's a good looking device and will be available in a variety of colours, it is also pretty lightweight at 105 grams and a little more compact than some other smartphones at 101 x 59 x 12mm. Talktime on 3G is quoted as being over 5 hours with 23 days standby time, but using applications tends to drain the battery faster. The 1230 mAh cell in the Wildfire S is not quite as good as the one in its predecessor, but it is pretty close. 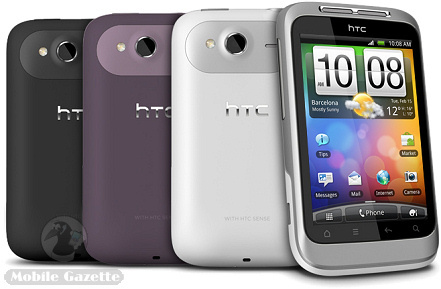 The HTC Wildfire S should be available during Q2 2011. No guidance was given on price, but we expect that this handset will cost between €250 to €300 at launch.